Elevator Control System ,full programmable to ant application control and drivre system,uml21lv,umf31lv,umf,umf-31ת,uml,uml31,uml-31,uml-31lv,uml11,uml-11,uml11a,uml-11lv,elv5,elv-5,elv-51lv,uml-51lv,lift controller,UML-51R,controller,UML-51F. 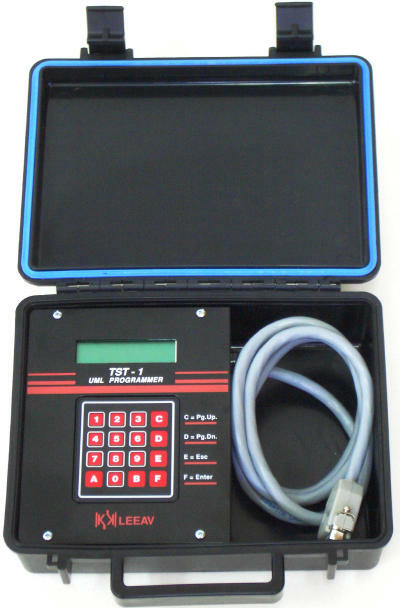 , TST-1 Programmer & Diagnostic. The programmer which provides both detailed status reports and programming of the elevator functions via its two main modes which are the display mode and the programming mode. The display mode presents a complete and updated record of the last 10 Failures and Events, and the current status of inputs and outputs as the microprocessor identifies them. The display mode may be used while the elevator is in motion without affecting the operation of the elevator. The display mode is a basic mode, which is accessed without the use of a code. 1. LAST 30 FAILURE: For each of the last 30 failures the following details appear on the screen,The name of the failure The floor on which the failure occurred (indicated on right hand side of screen). The input relevant to the failure The segment relevant to the failure (the floor indicator on the UML card also functions as a failure indicator, the relevant segment blinking to indicate type of failure. 2. LAST 10 EVENTS: For each of the last 10 Events the following details appear on the screen: The name of the Event The floor on which the Event occurred (indicated on right hand side of screen). The input relevant to the Event The segment relevant to the Event (the floor indicator on the UML card also functions as a failure indicator, the relevant segment blinking to indicate type of failure). The last events are presented in the same format as the last thirty failures. The programming mode is accessed only through the use of your own private code. This security feature is necessary because the programming mode enables changes to be made to timers, parameters ,the status of the lift and more.